The Brooklyn quintet Snowmine came together out of a long-time friendship between bassist Jay Goodman, drummer Alex Beckmann, and lead singer/composer Grayson Sanders. Adding guitarists Austin Mendenhall and Calvin Pia helped solidify their fascination with classic afrobeat, electro-acoustic soundscapes and 20th century classical orchestrations. Grayson, the son of an opera singer and oil painter, demonstrated an aptitude for classical and intelligent dance music at an early age. 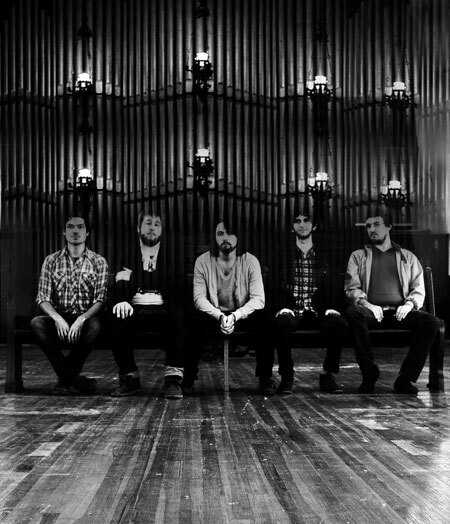 The band recorded their debut LP, Laminate Pet Animal, in the summer of 2010, and continued to tinker with it until its eventual Bandcamp release that November. With a vocal style that at times brings to mind Jim James of My Morning Jacket and Robin Pecknold of Fleet Foxes, the band’s overall sound sits favorably next to artists like Arcade Fire and XTC as well. Tell us a little bit about your band. The significance of your name, and which members play what instruments? Grayson Sanders: Prior to January 2011, we'd just been a group of friends who couldn't decide what style of music to play. We'd all come up in the jazz and classical scenes and were sure of two things at the very least: We didn't want to be a laptop band (albeit "a la mode"), and we loved a good pop song. I think our first attempts were pretty garbage – 10-minute prog rock epics with break-beat bridges. But we finally assembled some songs which ended up becoming our first album (released last May). Our name has a lot of significance to me because it refers to the story of my Grandfather leading a platoon through a snowy minefield in the Korean War – a story for another conversation. You titled your latest release Laminate Pet Animal. 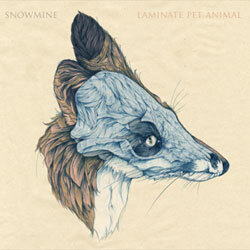 Animals as pets are, of course, a universal theme, but the word "laminate" adds some mystery to it all. What specifically does this refer to? Grayson: That album deals quite a bit with confusion over one's direction. (Relationship, Vocation, inability to read Google Maps – not the last one). If the "pet animal" is your affectionate, comforting friend or situation, then perhaps the desirable (and macabre) thing to do would be to preserve it forever? To willfully ignore or deny a murkier reality ahead or behind you? The idea with the artwork (done by our awesome partner Jesse Corinella), was to create a beautiful creature both alive and dead. Preserved forever – laminated. Oh, and also, you can read it backwards…LAMINA TEP ETANIMAL. The first track on that album "Beast in Air, Beast in Water" presents a songwriting style emphasizing traditional structures – what was once referred to as "hit radio" stuff. There is even, what sounds like, an orchestra string section at the end. Is this the bands intention? To perfect a pop rock radio friendly hit sound, on the level of say, a band like Coldplay or Vampire Weekend? Grayson: You used the "C" word. No, I don't think the idea of engineering your sound like a science project will get you anywhere at all, but writing melodies someone can remember is the best way to touch as many people as possible. And isn’t that the goal of the popular idiom? Oh, and if we ever write a song as popular as Clocks (The other, other "C" word), I’ll retire and go back to sampling frogs croaking over solo cello. The song "Penny" introduces other sonic elements to the overall audio palette. The use of glockenspiel and vocals moving in and out of the falsetto range. At what point during the songwriting process do these ideas develop? Are they carefully worked out in advance or are they added at the time of recording? Grayson: A lot of what you're hearing in "Penny" is vibraphone and re-amped vocals. We did most of those overdubs in my good friend’s studio in Bushwick (RAD Studios). A lot happens between the basics recording and the overdubs, as the foundation sounds of the band start to shift around in favor of elements that can’t necessarily be brought onstage. I guess the trick is keeping it interesting live and trying to re-capture as much of the recording as possible. Having your album mixed by Dave Trumfio (Wilco, My Morning Jacket) and mastered by Steve Berson (Sharon Jones and the Dapkings) adds an impressively professional sheen to it all. Are you fans of those bands and artists? Grayson: Huge fan of Sharon - that woman's fire could erupt a dormant volcano. I don't think our choice to work with Dave had as much to do with those other bands, as much as it did where we were at the time and his enthusiasm about working on it. If you could tour with any band or bands who would they be? Who do you see as a complimentary fit for your particular sound? Grayson: Right now we're into Twin Sister. We did a remix trade with them and can really appreciate their approach to harmony. Both bands commit a lot of attention to textural details, but where we tend to go ambient, they tend to reel it in. We’re returning to the studio very soon for our second album, and you’ll definitely be seeing a clearer identity across the whole of it. "The idea with the artwork (done by our awesome partner Jesse Corinella), was to create a beautiful creature both alive and dead. Preserved forever – laminated". The 5-piece embraces an indie pop sound rich with echo pedals, tribal beats, electro-acoustic soundscapes and classical orchestrations.